Home / Stories / Our Winter Getaway to the Oregon Coast by Joe Craven. 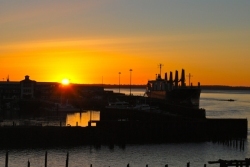 Our Winter Getaway to the Oregon Coast by Joe Craven. At the end of last year I entered a contest on Facebook. It was called the “Win A Winter Getaway to the Oregon Coast” contest and was put on by the Oregon Coast Visitors Association. I had to write a story of 300 words or more about an experience I’d had on the Oregon Coast. The winner would receive 2 hotel night accommodations and round trip airfare with SeaPort Airlines. Well needless to say (or this would be a very short story) after a couple of weeks of people voting for their favorite story I was notified that my story, “Honeymoon Hopefuls” had won! Melanie & I were very excited and couldn’t wait to get more details. 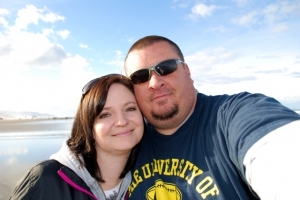 We chose to visit Astoria because we had never been there and wanted to see more of Oregon. The rules stated that we needed to take the trip before the end of February. We decided to schedule it for the 19th of February, 2011. so we could save up some money for gas for the 8 hour drive to Pendleton & back, a rental car while in Astoria, a room night Pendleton for before and after our Astoria trip and, of course, food and maybe souvenirs. Well, the 18th came and we could hardly stand it. Our kids were with their other parents as it was Presidents Day weekend. We woke up bright and early and started our roadtrip to Pendleton to catch our flight the next morning. We had emailed Rebecah Lutz at the Oregon Coast Visitor’s Association (OCVA) prior to our trip to see if she could give us some recommendations of a places to stay while in Pendleton. She and Valencia McNatt with the help of Yolanda Lennon from the Pendleton Chamber of Commerce, provided us with a list of hotel options as well as some with discounted rates. We arrived at our chosen hotel, The Rugged Country Lodge, that afternoon and checked in. It was a charming place and more importantly clean. The people at the front desk were very kind and helpful on suggesting places to eat that evening. The next morning we woke up and prepared to check out and head to the Eastern Oregon Regional Airport At Pendleton to catch our flight. This is when we received the first of, what we would later find to be, many surprises. While at the front desk checking out, the young man informed us that our charges for the night and in 2 days when we return from Astoria had been taken care of by Rebecah with OCVA. Our jaws nearly hit the floor with this news! We quickly thanked them and scurried to the car so no one would see Mel & I breaking down in tears. We were already overwhelmed at the fact that we’d won this trip, but to be surprised with people going above and beyond what had already been promised was more than we could handle at that time. We have been hit with some pretty poor luck and unfortunate circumstances over the past couple years and were direly looking forward to escaping and getting away with each other to refocus and re-energize. 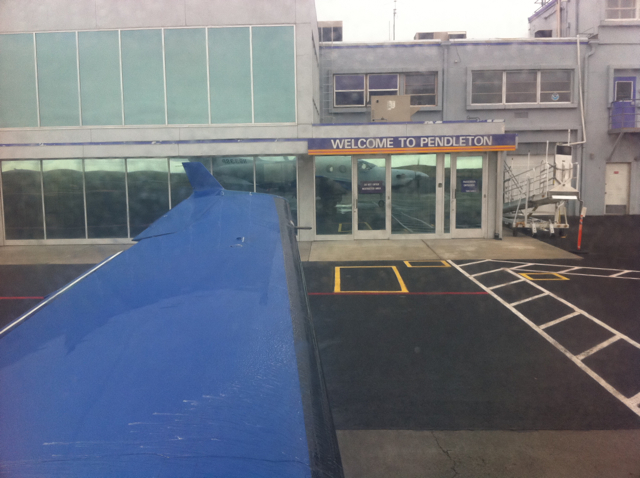 We then made our way to the Eastern Oregon Regional Airport At Pendleton. We were not disappointed with SeaPort Airlines. No rubber gloved body searches or x-ray machines to walk through. In fact I even boarded the plane with a bottle of liquid! The staff was friendly, from the front counter personnel to the pilots. It was a wonderful and unique experience! During our brief layover in Portland Melanie was contacted by Donna Quinn, with the Cannery Pier Hotel in Astoria. She was calling to make sure we were still coming and to let us know that she had made arrangements for a person named Skip to meet us at the Astoria Regional Airport and he would give us a ride back to the hotel. This was another pleasant surprise as we’d just planned on renting a car or grabbing a cab. After the quick flight from Portland to Astoria we were greeted on the tarmac by an older gentleman named Skip Hauke who also happened to be the Director of the Astoria Chamber of Commerce. He grabbed one of our bags and escorted us into the terminal and to a rental car office. After some quick introductions and exchanging of information Skip threw down his credit card and paid for our rental car for the weekend! Once again Melanie and I were thrown back and a bit bewildered by the kindness and generosity that had kept being thrown our way at every turn. Skip then led us in his truck to the Cannery Pier Hotel where he helped us in with our bags, introduced us and got us checked in at the front desk, then helped us to our room. He then produced a map of the city and began to mark many different attractions for us to see. After Skip left we took a minute to soak in our surroundings. The room was amazing! The views from our private deck, even more amazing! We then focused our attention to the table in our room filled with champagne, chocolate, smoked salmon, free passes to many local attractions and museums. There was also a note from Donna informing us that our names had been left with many other local establishments granting us free access and to top it off, she’d made dinner reservations at Bridgewater Bistro and Clemente’s, two fine dining establishments, for our 2 nights in Astoria. Again, Soooo overwhelming. It’s hard for me to put into words, the way Mel and I were feeling, although complete humility and gratitude have to top my list. We decided to go check out the Astoria Column first. It is a beautiful piece of architecture. It was 164 steps to get to the platform 125′ above the ground. Our legs felt like rubber once at the top but Holy Cow were the views worth it! They sell little balsa wood airplanes in the gift shop that you can launch from the top of the column. Pretty fun to watch. We then decided we should head back to our room to get cleaned up for dinner.We just walked over to Bridgewater Bistro, just on the other side of the pier from the Cannery Pier Hotel . Our dinner was amazing! The food was terrific and the views overlooking the Columbia River and the Astoria-Megler Bridge were breathtaking as the sunset. The next morning, after Mel’s soak in the big claw-foot tub, we decided we couldn’t stand it anymore. We had to see the ocean and walk on the beach. We jumped in the car and made our way to Seaside and Cannon Beach. It turned out to be a beautiful morning at the beach. We walked around for a bit looked at the starfish and at Haystack Rock. We found 3 sand dollars, uprighted some alien looking crab thing then made our way back and had a delicious breakfast at the Wayfarer Restaurant overlooking Haystack Rock on Cannon Beach. After breakfast we decided to drive south down the coast stopping at many scenic overlooks along the way until we finally made it to Tillamook. Since we’d used up far more of our day than anticipated and had toured the Tillamook Cheese Factory on a previous visit, (which I highly recommend),we decided to save time, grab my Squeaky Cheese and get back on the road back to Astoria. On the way back Melanie and I, due to the generosity of all who had contributed to this amazing trip, decided to reinvest into the local economy of Astoria and shop for some new clothing! We had felt fairly underdressed at dinner the night before because we weren’t planning on being able to afford to eat at such fine dinning establishments. After shopping went back to our room to get ready for another special dinner. The Cannery Pier Hotel had reserved one their Chauffeured Classic Cars to take us to Clemente’s. It was a loads of fun and turned a lot of heads. After arriving the host escorted us to our private reserved booth. That night we decided to step out of our comfort zone and treat ourselves to dishes we wouldn’t normally order. It was all so delicious, from the appetizers to the duck and the desert. 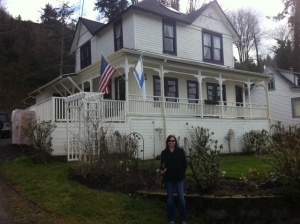 The next morning we decided to go check out the house from the Goonie’s movie. When we were up on the hill we heard sea lions barking down by the docks, so we drove down by one of the piers to investigate but were unable to find them. Since we were already on Pier 39, we toured the BumbleBee Tuna Historical Museum then went and enjoyed a warm drink at Coffee Girl. As we sat enjoying our drinks on the dock overlooking the river, a friendly local fisherman came over and started talking to us. We must have looked like obvious tourists, because he started, joking and asking us if we wanted to take some sea lions home with us. He told us that when they start seeing them in Astoria, the salmon were not far behind. He then gave us directions to where we would find sea lions hanging out so we could get to see them after all! Once we had our fill of watching the antics of the sea lions, we decided we’d drive across the Astoria-Megler Bridge to check out Cape Disappointment and that area. On our drive back we kept getting sidetracked by all the wild life. I had to stop and take pictures whenever I saw wild life, especially Bald Eagle! By the time we made it back to Astoria a lot of the museums we’d planned on seeing were getting ready to close. We were however able to do the speed tour of a couple of them including the Columbia River Maritime Museum. Before we knew it, it was time to head to the Astoria Regional Airport to return the rental car and catch our flight. Surprisingly this was a favorite memory of our trip. When we noticed the plane coming into the terminal it was a different plane than the others we’d flown on. The wings were above the plane and the landing gear was stationary. Melanie and I had the entire plane to ourselves until we connected in Portland. It was BEAUTIFUL! We flew, what seemed to be, only a couple hundred feet high along the Columbia River all the way into Portland. Mel had taken some Dramamine so she was even able to enjoy the views as we flew. Before we knew it we were back in Pendleton to spend the night and the next morning making our 8 hour journey home. Back to work and shoveling the driveway…….. Already day dreaming about our next adventure….